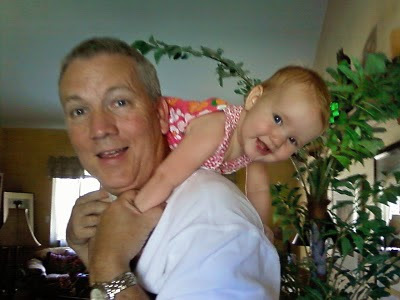 When I was a little girl my dad used to carry me like this...my family calls it the sheepy carry. I used to love being carried like this and if my memory serves me correctly it was really uncomfortable. I remember I would find the perfect position, let myself fall asleep on his shoulders and wake up in serious pain. When he would let me down, my ribs would take 5-10 minutes to reposition themselves and my head would be stuck pointing in the three o'clock position leaving an annoying ache for the rest of the day. And yet there was something so exciting about this type of travel. Maybe it was the fact that we called it the "sheepy carry"? Sounds soft and fluffy. Regardless of the aches and pains that I know she will incur, I can not wait to hear Scarlett cry out for the first time..."Grandpa, can you carry me like a sheepy?" Happy Birthday daddy (Grandpa). I hope that the sheepy carry tradition that you began with Breanna and I continues for generations. I will always have fond memories of falling asleep on your shoulders knowing it was a safe place to rest and dream. I love you.